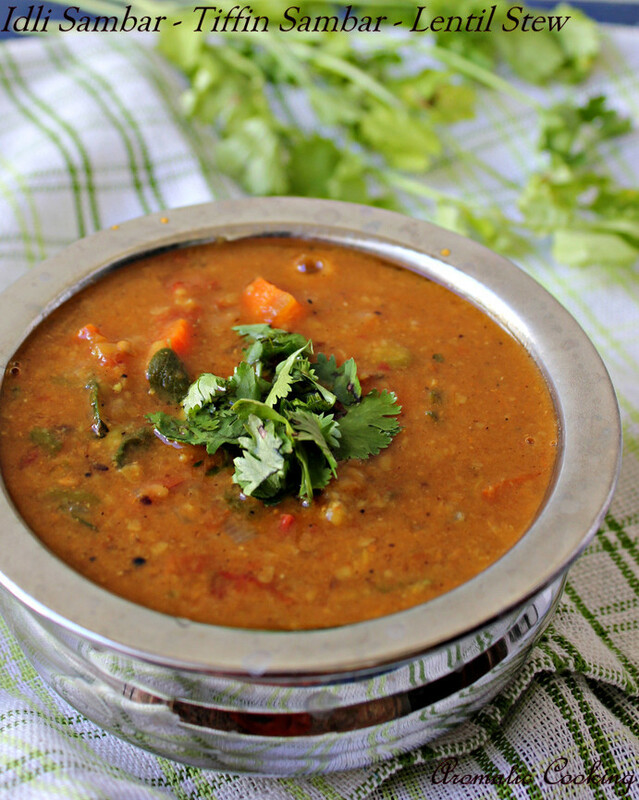 Sambar is basically a stew like preparation made with lentils and vegetables. In South India, we make many varieties of this sambar, most of the times, flavored with home made sambar powder, and the different vegetables added to the sambar giving it a unique flavor. Then we make sambars with freshly ground paste along with coconut and then this idli or tiffin sambar. The main difference between the sambars that we mix with rice and the sambars that we have with our tiffins like idlis, dosas and vadas is the former is more tangier than the latter. I make this sambar with sambar powder, but I add ground fresh spices at the end for the extra flavor, this also goes well with the Ulundu Vadais/ Black Gram Fritters that I had posted earlier..
Roast the ingredients given under 'roast and grind', till slightly golden and powder it. Pressure cook the tuvar dal with the turmeric powder, mash it slightly and keep. Heat some oil, add the mustard and cumin seeds, when it starts spluttering, add the asafoetida, followed by the onions. Saute it till it turns pink, then add the carrot, eggplant and the peas. Saute for a minute, then add the tomatoes, keep mixing for 2 minutes. Now add 2 cups of water, the sambar powder and salt, cover and cook on medium heat, till the vegetables get cooked. Then add the cooked dal, mix, add a little water if it's too thick, also add the ground spice powder, mix and bring everything to a boil. Simmer it for a couple of minutes, then add the chopped curry leaves and coriander leaves and switch off. Serve it hot with idli, dosas or vadas. 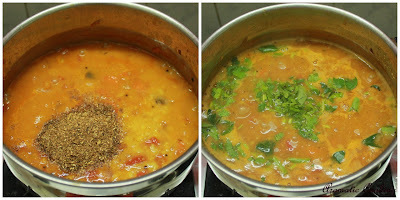 You can cook the tuvar dal in a regular pot, the cooking time is longer, soak it for some time to speed up the cooking. If you don't have sambar powder, then you can replace it with a teaspoon of red chilly powder, a teaspoon of coriander powder, ready made sambar powder is available in Indian grocery stores. 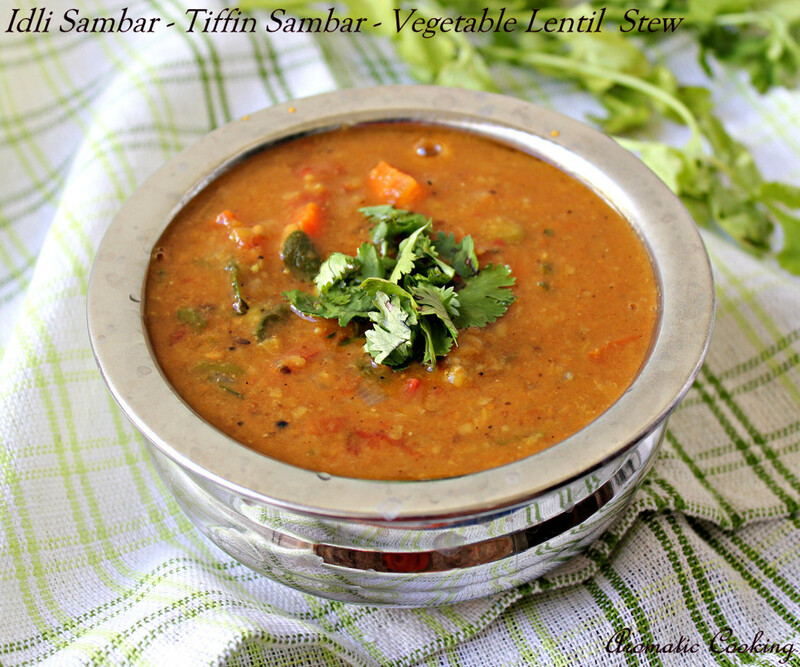 You can also add other vegetables like green capsicum, cauliflower to this sambar. One of my fav recipe,love the flavourful sambhar!! how about some vada sambar :) delicious preparation.. I love the color of the sambar....awesome.. So tempting and delicious. I can literally smell the aroma of it. I love this homemade sambar from scratch. The sambar looks great. Will try that last minute fresh spice powder next time. That is a nice tip to make it seem freshly made ! Who doesnt love sambar. All time favorite. It's a long list of ingredients, would be glad if someone else make it for me. Fingerlicking flavourful sambar, love to have with some crispy dosas.